I was sent the Rosy Summer Flowers and Lovely Lilac metal dies by Spellbinders to play with and I had a total blast creating this layout! I didn't use a particular collection, I just knew I wanted to play with washi tape. Read on to find out more! Elsie Robinson shared her craft room tour and I fell in love with the idea of placing washi tape rolls around an embroidery hoop. I don't have a whole lot of washi and they've just been sitting in a generic ziploc baggie for years. Not very fancy eh? I brought them out of the bag, arranged them in rainbow order, got rid of a few, and put the rest on an embroidery hoop which now sits above my filming station within arm's reach. I was itching to use them on a layout ASAP! As I was laying in bed about to fall asleep I thought about how I was going to use these metal dies and came up with the idea of covering a piece of cardstock with all my washi tapes. No longer out of side, out of mind! Other ideas were watercoloring over the flowers or backing them with patterned papers. I've tried both of those techniques before, but never the washi idea, and I was excited to finally use my long forgotten washi rolls, so that's the direction I went. I grabbed a piece of smooth white cardstock and started placing torn pieces of washi tape across the entire background until it was filled up. Then I die cut as many of the flowers as I could from the custom washi paper - I got 10 of the smaller Lovely Lilac flowers and 6 of the bigger Rosy Summer flowers. I love the look of these washi flowers, especially the gold glitter bits! I also cut the coordinating solid flower to go underneath each flower from smooth white cardstock. Then it was time to choose a background paper. I tried a few different cardstock colors like white, dark gray, and baby blue but wasn't feelin' it so I pulled out the Summer Lights collection by Pink Paislee and picked out a few patterned papers I thought could work. Ultimately I chose this ombre pink paper and placed the flowers in three rows across the page. I used dimensional adhesive to adhere the flowers in place. Next came the photos - I've had this trio of photos of Jane being her cute self in my photo box for about a year and loved the contrast of the yellow background in the pictures with the purples in the paper and flowers. Three photos = one on each row of flowers. I made the title with the mini gold Thickers from the Auburn Lane collection by Pink Paislee. Before gluing the photos and title in place I splashed white acrylic paint over the flowers where the photos would be placed. I fussy cut a few bows from Pick-Me-Up Paper 03 and adhered them next to the title words. I wrote a few lines of journaling with a white pen on the right edge. The layout didn't feel quite complete so I brought out my small enamel dots stash and sprinkled them around the layout. All done! You clever gal! 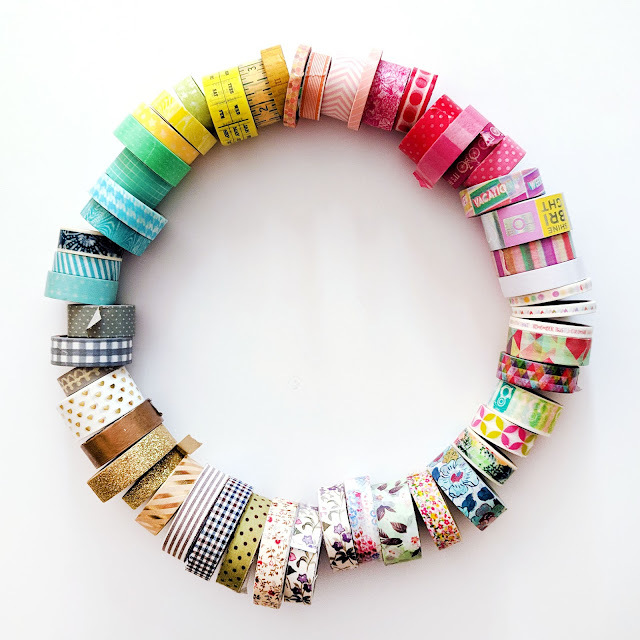 I can send you more washi tape to fill out your collection. LOL! Thank you once again for your inspiration. Ohhhhhhhhhh I am IN LOVE with this! LOVING those gorgeous flowers and the stitching!! And loving what you did with the washi! So clever!!!!!!!!!!! !